The Blackhawks are a great team made of great players. Some players are Johnathan Toews, Pat Kane, Andrew Shaw, Duncan Keith, Pat Sharp, Marian Hossa, Corey Crawford, Brad Richards, Kris Versteeg, and Ben Smith. The Chicago Blackhawks were established in 1926. They have 5 Stanley cup victories. The coach of the Blackhawks is Joel Quenneville . 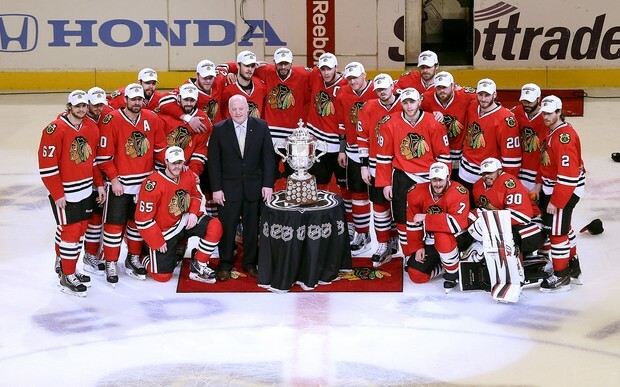 The Chicago Blackhawks have 5 Stanley cups. The years were 2013, 2010, 1968, 1938, 1934. My favorite player is either Andrew Shaw or Kris Versteeg. They are my favorite because they are both right handed short guys who get pushed around but fight back. The Hawks have a lot of events. They have Stanley cup parades, a convention, charity, they give back to the community with parties, and they bring home soldiers.